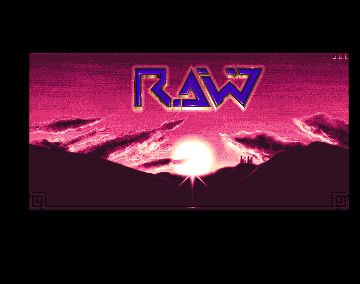 The opening title picture is Sundawn (raw edition). For HD install, the disk/assign MUST be called "R.A.W:". News in the magazine that Walkman had joined Scoopex were incorrect. In addition to the writers actually credited in the credits screen, also the pseudonym Morten H, Benji contributes articles to this issue. It is not clearly stated in the credits of the mag that Kingpin was infact in New Wave and not Pure Metal Coders at the time, but it is in the article "Slogans (s-z)". Contains reviews of Surprise! Productions Laterna Magica (slideshow), Atlantys Slideshow (slideshow), Acme Factories The Acme 1991 Slideshow (slideshow), Majic 12 Ray of Hope 2 (demo), Anarchy Digital Innovation (demo), Devils No Reality (demo), Spreadpoint Cube-O-Matic (demo), LSD Despair (demo), Kefrens Guardian Dragon (demo), Equinox So What (demo), Andromeda Suffocation (demo), Motion Confuzion (demo) and Talent Mini Intro (intro). Features interviews with Svein Berge (coder of Twintris), Steinar Apalnes of Airborn, J.O.E of Surprise! Productions, and Elmer of Symbiosis, as well as a large report from the Razor 1911 & Imp-666 Amiga Conference 1991.